Mieke Bal. Eu canto a quen comigo camiña. Santiago de Compostela: Laiovento, 1998, edited by Ria Lemaire, 228 pages. Translated by Marta Pino Moreno. ISBN: 84-89896-23-2. Spanish translation of the original title: Mieke Bal, Ik zing mijn lied voor al wie met mij gaat. Vrouwen in de volksliteratuur, in Ria Lemaire (ed. ), De Bijbel als volksliteratuur. Utrecht: Hes & De Graaf, 1986, pp. 4571. 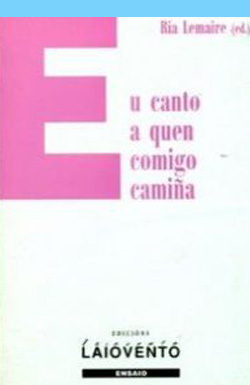 Published in Spanish by Edicións Laiovento.